The 3 H’s Trilogy: A mix of comedic bizzaro romance horror, cosmic horror, and occult dark fantasy, The 3 H’s Trilogy begins when a gardener discovers a disembodied head in her mother’s garden. What starts as an absurd love story turns into a gruesome inter-dimensional nightmare. Consists of The Head, The House, and The Hell. Elizabeth walked up to the head and picked it up in her pink gloves. She stared at it for a moment, before taking it into the house with her. 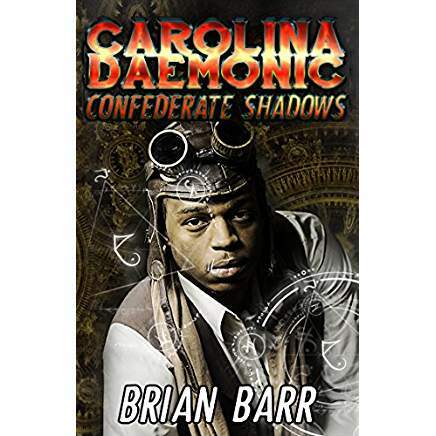 Carolina Daemonic: Confederate Shadows: The first novel of Brian Barr’s Carolina Daemonic series released in 2015, Confederate Shadows is an occult urban horror fantasy with steampunk elements set in an alternative dystopian world where the Confederacy rules America. 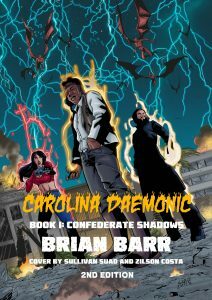 Uncompromising and raw, Confederate Shadows takes us into a world of grotesque monsters, dark magic, and chaos. The redhead looked up at the skies, coaxing Wei to look upwards as well. Far off dark bodies could be seen, flapping and soaring like wild birds, closer and closer. Behind them, far off into the distance, Wei could see what looked like a weird blue portal, opened with lightning bolts dancing within its womb. Wei slowly stood up, shaking uncontrollably. She didn’t know what to say. The woman gazed back and stared with a smile. “You will join us in our realm. This place reeks of mundane and disgusting men. It is no place for those like us. “Wh…who are you then?” Wei asked, truly curious, but afraid to really know the answer. Descending from the heavens in the black pool of night, something came. Something more foreign, more of an “other,” an outsider, than any societal scapegoat could have dreamed of being in the eyes of a fearful oppressor. Something further removed from the normality of society, from the expected nature of life and existence in general. The creature was humanoid in shape, recognizable mostly in the fact that it bore a head and neck with extended fins, torso and limbs. The composition of this thing seemed flesh-like, if flesh were turned inside out, pinkish and vein-ridden, muscle spasming and pus fizzling with what looked like the result of viral diseases. Its eyes were round and popping out, the pupils dilated. Bizarre and uncanny, it seemed to glide with ease from the heights of the sky. It fell onto the back of the unsuspecting sailor, wrapping its legs around the gasping man’s torso. A strange black collar flashed with rainbow lights around the demonic thing’s neck. Its hands were outstretched with sharp, shiny nails, its jaws open as a long tongue licked the air with insatiable delight. The woman watched the thing fall for probably three seconds, astonished by the sight, left thoughtless. Had the thing taken an extra second to descend, or even an extra millisecond, the strange drunk’s foot would have found its way to her gut. That cruel show would’ve kicked her pregnant stomach, risked the life or welfare of the living organism, or organisms, incubating inside her. For its timing, the unintelligible thing was a savior in some way, a knight in flesh tissue and demonic extensions of tongue and nail. A holy savage fiend, a living oxymoron of the highest degree. She couldn’t pinpoint what to call this angelic demon, feeling both awe and dread in one shattering moment. She still screamed. Still screamed as the ravaging thing grabbed her assailant. 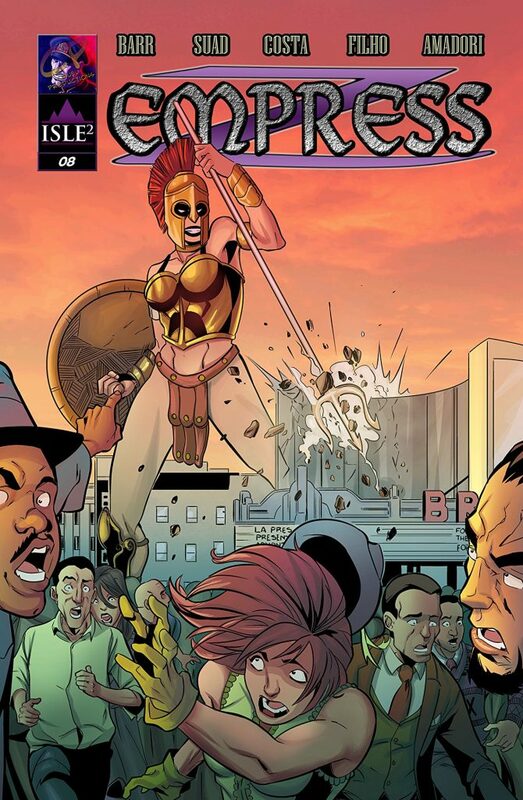 Empress: Co-created and co-written by Chuck Amadori and Brian Barr, Empress is a comic book series that centers around Zia, a famous Hollywood actress who goes missing in the early 20th century. She returns to America as the embodiment of the chthonic goddess Hekate and ushers in a new age for the same world that oppressed her spirit and legacy. 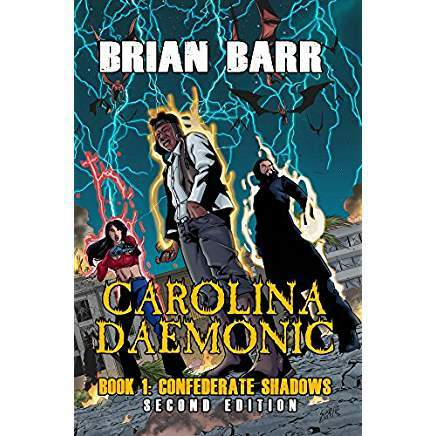 Born and raised in Hawaii, Arizona, and Maryland, Brian Barr resides in South Carolina and is the author of the Carolina Daemonic series, the 3 H’s Trilogy, the Nihon Cyberpunk collection (read my reviews of #2, #3, and #4), and the Brutal Bazaar collection. His stories meld fantasy, horror, and science fiction, with themes that range from the occult to the exploration of the human condition, art, music, societal issues and political concerns. As a small press and independent author, he is heavily influenced by DIY and punk culture when it comes to formatting and releasing his work. 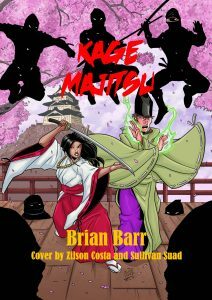 Brian has written novels, short stories, and comics. 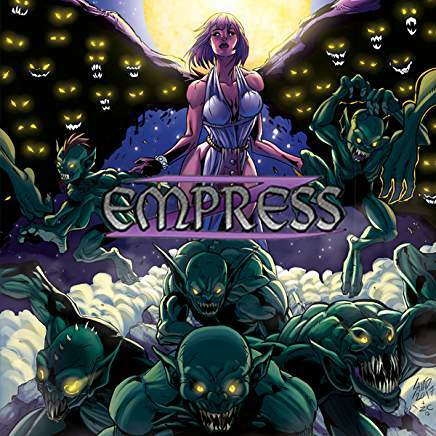 He co-created and co-writes the comic book Empress with Chuck Amadori, which features art by Sullivan Suad and Zilson Costa, colored by Geraldo Filho. Sullivan Suad and Zilson Costa have also collaborated with Brian to provide many of the art for his covers. 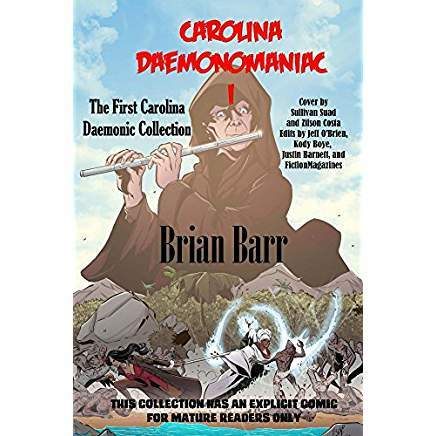 Carolina Daemonomaniac I: The First Carolina Daemonic Short Stories Collection: This is the first collection of Carolina Daemonic short stories. 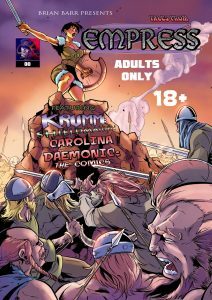 Along with the steampunk war comic The Tamed Tiger, Carolina Daemonomaniac includes various tales of Voodoo/Vudon spirituality, necromancy, weird science and the undead. 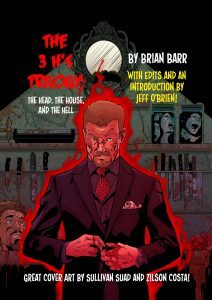 Brutal Bazaar: A horror collection of short stories, Brutal Bazaar includes The 3 H’s Trilogy, The Bloody Writer’s Trilogy, Badlam Betty, and various other bloodcurdling tales penned by Brian Barr. From slashers to occult horror, these tales include gruesome scenes mixed with dark humor and existential dread. 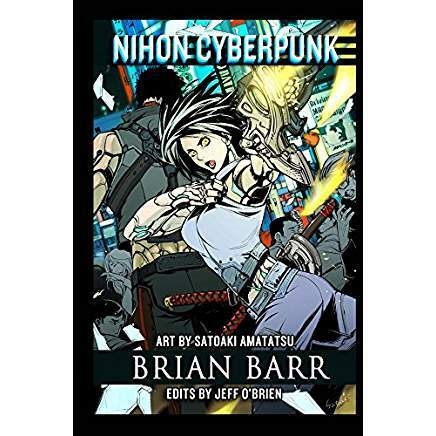 Nihon Cyberpunk: Nihon Cyberpunk is a collection of science fiction stories set in Japan. Inspired by Black Mirror, The Twilight Zone,Akira, Ghost in the Shell, and various other sources, Nihon Cyberpunk explores the human condition and probes philosophical questions in a dark and dystopian Japan ruled by technology. 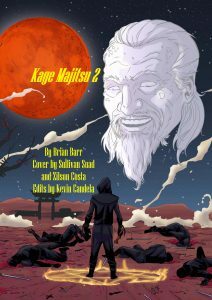 Includes The Kage Majitsu Trilogy and An American Otaku in Neo-Nihon’s Underbelly as bonus stories. Science fiction and horror writer Brian Barr was my first writer Facebook friend. He sent me a friend request after reading my story in Storyteller, an online literary magazine that has accepted much of his work, and he invited me to follow Dark Chapter Press, who held contests that I entered. I didn’t win any of the contests, but I was welcomed into a supportive group of creatives, several of whom are also now Facebook friends. Brian’s friendliness and positivity launched me fully into an online writerly mindset, and now I’m in several writers’ groups on multiple social media. He inspires fellow writers online by being himself, with his personality shining forth gloriously. He also happens to be a brilliant storyteller. Check out the links, like this one The Head: Book 1 of the 3 H’s Trilogy, to his work and collaborative projects, such as Empress with Chuck Amadori, throughout this blog! Here’s his Amazon Author Page. I haven’t met Brian Barr in person, but online, he’s a super nice guy, positive, and always supportive of other writers and artists. Follow him on his Facebook page www.facebook.com/brianbarrbooksdotcom and website www.brianbarrbooks.com. Feel free to ask him questions about his work, any upcoming projects, or his professional life. His illustrators, Sullivan Suad and Zilson Costa, are also open for commission, so please do inquire if you need cover art. 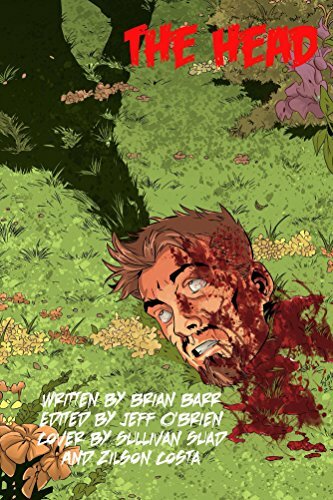 Even if you’re not hooked on his genres, I highly recommend reading Brian Barr’s work, as it transcends those genres due to his storytelling talent.